Přední navíjecí bezpečnostní pás červený jedna strana 1ks. 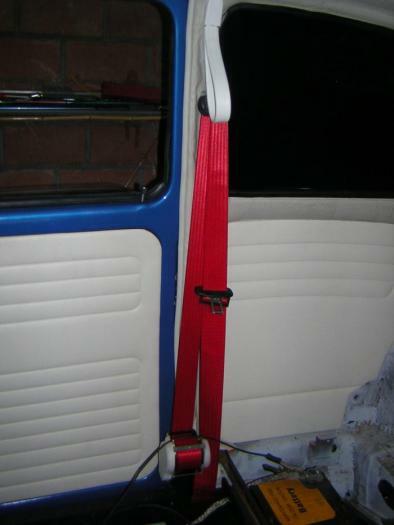 Automatic seat belt red each. Automatic roll-up belts, the first three point belt dates from 1959 and was developed by Volvo, to this day we still use the same design though this is developed through the years. As of January 1971 in the Netherlands belts mandatory if they are present. If you have a car of an older age without seat belts, you do not to install but we recommend handle this. The mentioned here 3 point seat belts have a retractor which ensures that the belts neatly hung away and will not sway in your car. Obviously with a European approval and available in various colors which you can combine with the rest of the interior. Come complete with mounting hardware each delivered. Note : The belt mechanism should be well fitted right, if not, it stays locked so it does not unwind. Many also try the belt unassembled draw which he (if this law is held exactly) directly blocks, first well from his cassette right fit and then testing is the only good advice. Držák bezpečnostního pásu v kabině levý. Bracket for retractable cabin seat belt left. Držák bezpečnostního pásu v kabině pravý. Bracket for retractable cabin seat belt right. Přední navíjecí bezpečnostní pás šedý jedna strana 1ks.